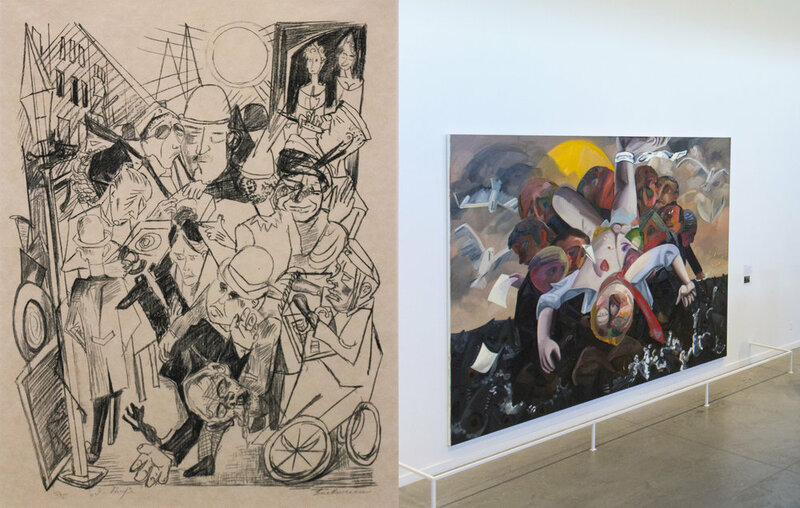 The Cleveland Museum of Art is concurrently hosting a pair of exhibitions which are unwittingly in great conversation with each other, Dana Schutz’s Eating Atom Bombs and Graphic Discontent, German Expressionist works on paper. Schutz, whose recent painting of Emmett Till sparked controversy at The Whitney, is showing a new selection of paintings at Transformer Station, a satellite gallery that works with the Museum to host contemporary art exhibitions. Transformer Station is showing these in light of the 2016 election and the precarious times they’ve revealed. The second exhibition features work from some of Schutz’s biggest influences; Ernst Ludwig Kirchner, Otto Dix and Max Beckmann. Either of these exhibitions would be a joy to see on their own, and there’s plenty to mull over from the context of each. However, seeing the two together really gives one an entirely new story. Being able to compare the content across time through a similar visual language creates a rounded picture of our political and social situation and puts the current milieu into perspective. Ernst Ludwig Kirchner, Woman Buttoning Her Shoe, 1912, Woodcut. Graphic Discontent features over 50 prints and drawings from the German Expressionist groups, Die Brucke (the Bridge) and Der Blaue Reiter (The Blue Rider); but it also features contemporaneous German artists not typically associated with German Expressionist groups, namely Kathe Kollwitz and Paula Modersohn-Becker. These artists’ motivations came from the disillusioned mindset of a postwar Europe. They tossed aside traditional academic techniques and adopted a graphic language to organize the space in an image. They worked with spontaneity and prioritized images that were harsh critiques of the moment, churning out many copies by embracing printing technologies of the time. Take Hell: The Street by Max Beckman for example, this print describes the November Riots of 1918 and shows a mob carrying a beaten man through the street. The vision is Steadman-esque. That is, the expressions of many of the figures are closed, caricatured, and cruel. Motifs of this exhibition both reference and challenge familiar art historical themes in their graphic mark-making, which is urgent and quick to the point. One gets a sense of a hectic time of uprooted tradition where no one knows which way is up. The dire position of people during this time is mediated by caricature and an overtone of absurdity. Prints depicting brothels are framed next to others showing bathers, mountainous landscapes next to urban riots. Dana Schutz, Deposition, 2017, Oil on Canvas. Max Beckmann, Hell: The Street, 1919, Lithograph. Eating Atom Bombs collects a series of Schutz’s works from the past decade with the great majority made in the past two years. The work uses art historical references to channel America’s current political zeitgeist, From Masaccio’s Expulsion in Schutz’s painting of the same title, to Goya’s Saturn Devouring his Son in Schutz’s Rage, which shows a blatant likeness of Donald Trump ripping out a woman’s blonde hair for his own. Schutz has built up the paint to a sculptural level in parts and it appears that she has even applied it straight from the tube in places. Color is used exuberantly in Schutz’s work, another thing lacking from the German Expressionist exhibit. However, her dealings with space are consistent with the German Expressionists. Schutz’s twisted figures are similarly painted with extraordinary directness. Their wide eyed, blank stares remain remarkably open to sympathy even amidst the absurd situations they find themselves. Most of the paintings are large scale and the viewer’s relationship to the figures is bodily; perhaps encouraging an empathetic reaction. One comes away with the sense that these paintings explore the relationship between hardship and empathy. Unlike German Expressionist works, Schutz’s figures are more restrained and varied. Her’s express fear, sadness and remorse amid violence. Graphic Discontent does have tastes of these emotions through Kathe Kollwitz and Paula Modersohn-Becker, who offer similar humanist visions in their figures. Kollwitz’s lithograph, Woman with Folded Arms notably depicts a contemplative moment of uncertainty. The control over darks and lights within the shadow regions here is impressive and Kollwitz shows tenderness with surprising directness. Hints of this sense of touch can be found Schutz’s paintings, particularly in the faces completely enveloped in shadow (A common motif in her paintings seems to be an ambiguous light source from behind.). The German Expressionists handle their compositions in a way that allows the viewer to become aware of the frame of the picture as the elements within actively bounce against it. The effect of this contradicts itself and creates an open, airy atmosphere within the flatness of the rectangle. Schutz, a Neo-expressionist painter, also approaches mark-making in a similar fashion. There is a sense of straightforward deliberation and a get in-get out mentality even in some of the looser passages. Dana Schutz, The Philosopher, 2015, Charcoal on Paper. Max Beckmann, Self-Portrait in Bowler Hat, 1921, Drypoint. It’s a rare occasion to see two great shows so closely related from a single institution. It is interesting to see how a modern critique of the time we live in can embody such uncertainty. Whereas the German Expressionists appeared to take an adamant stance of disapproval in their art, Schutz offers something more. Perhaps this is reflective of the number of different perspectives available today. Her painting, To Have a Head, which shows a figure holding a plethora of disparate marks of paint within their skull, appears to say as much within the context of this show. Seeing these shows in tandem serves as a reminder that chaos and uncertainty are always around the corner, and that the reaction must evolve as much as the problems have. Graphic Discontent shows at the Cleveland Museum of Art through Sunday May 13th and Eating Atom Bombs shows at Transformer Station through April 15th. Ryan Kerr is a student at the University of Cincinnati. He is studying Fine Arts at the College of Design, Architecture, Art, and Planning (DAAP) and is also working toward a Visual Art Education License. His art practice typically consists of traditional drawing and painting, but he also is interested in digital mediums due to their constantly evolving nature and the possibilities that this could bring in the future. No matter the medium, He believes art says a lot about the times we are living in and examining that can bring great enrichment and meaning to everyday life.